This is sort of a wild color combination for me -- I rarely venture into the Land of Bold Brights. I wanted to see if I could take an image that had sort of a turn-of-the-century naturalist feel and put it with an odd color combination. I layered Glorious Green (could it be the first time that I'd ever used this color? ), Brilliant Blue, Night of Navy and Vanilla. 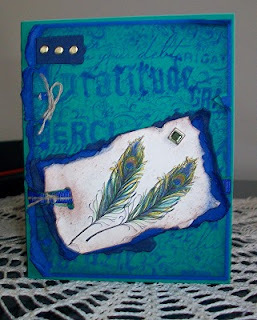 The Glorious Green layer was stamped with Gratuitous Graffiti in Brilliant Blue craft ink and sponged around the edges. The central image was overstamped with the spatter pattern from Itty Bitty Backgrounds using Close to Cocoa. The tips of the peacock feathers are dusted with gold Fine Galaxy glitter. I love it -- especially the colors!! There are a lot of Bold Brights that I haven't used either and am totally surprised you got this look from this combo. Wonderful share. I don't think that I'd ever used Glorious Green before -- the top edge of the cs was all faded!